I’d gotten busy and fallen off pace after hitting my first hundred articles early in the contest. I just noticed how close to the deadline we were getting about a week ago, but I should still make at least the double #HAHD goal…gotten 70 or 80 articles in since I noticed and should have plenty of time for another 40 or so this week. I have completed my 100 articles, like i did last time. But last time, i got a coupon code of $20 to do shopping on cafepress.com site and NOT the prize that was listed here. The coupon code you received was for qualifying for the “#HAHD Cartoon Mug Mini-Challenge” not the #HAHD Challenge itself. Somebody from Member Support will contact you regarding #HAHD3. Hi, I just received the HAND3 prize. Thank you very much :-) Now waiting for the prize of HAND4. Everything is ok, I am trying to understand the language and system. Thank you for your advices! My heart was in the right place. My life took a turn and I followed it. Next time…I’ll take control. Sorry for signing up and not following through. I’ve got 6 articles to go for 100 – quite pleased with myself as I dropped out of the last one. I’ve had an increase in traffic & sales already too. That little magnet you sent out helped keep my motivation up, as I was feeling quite bored with the whole thing & debating whether I should continue when that arrived! And…I’ve reached 200. Added 17 articles so far today. I might still be able to make my original goal of 250 for the challenge at this rate. I long ago completed the HAHD challenge, and doubled the involvement by completing exactly 200 articles within that same time. It has been fun because I paced myself to get involved in new niches, and I enjoy a huge increase in traffic as a result of completing these articles. There is no doubt I will be participating in future challenges also, and I now know I can complete twenty-thirty articles in any niche now that I have done this within your challenge framework. Been fun, and I do look forward to downloading the certificate of accomplishment. I’ll squeak in just over the two hundred mark! I have three and a half more articles to go – I’m in the middle of one right now. It certainly keeps your nose to the wall and your back to the grindstone .. or something!! It’s great fun! Nice swag. Or is it schwag? Met my 200 and working on my personal goal with the last few days left. It’s been another fun one! i could not get any income from this. If I submitted my articles on the last day and it is approved after the 8th August, am I considered qualified? In a word, yes. The challenges are always based on submission date, not approval date. hurray! Just hit 269 articles, can I make 300? Let me try? Im up to 245! Feels really goold! Thanks for setting up the challenge, great idea, best motivator ever and look forward to the next one. I was side tracked by some new business enterprises and had posted on Facebook I wouldn’t even make my 100 much less my personal goal of 200. I’m working hard. I have 12 more to go by tomorrow’s deadline. I plan on at least 3 more by bed time … all in a new niche. Just finished submitting my 100th article to complete this challenge. I will add a few more tomorrow. Having now completed 4 challenges is a good thing. Thanks again to Ezine for their support and encouragement. Congratulations! With 4 challenges completed you are an inspiration. I have three done this morning. I’m going to complete this challenge. It will be my second! I come back her for support. WoW – I just submitted my 101st article this morning. I started two weeks late, so had some catching up to do, but this was really fun and it has been rewarding to know I can crank out something with regularity. And, I’m proud of what I wrote. Most of my articles were well over the 400 word minimum and contained great content. Now, I have several months of blog posts and maybe more if I chop the articles down into bite-sized pieces. Thanks so much for the opportunity! 101 … and I learned so much about writing … and I will have a whole slew of articles going out for my new affiliate niche … thank you EzineArticles for the inspiration! I accept your challenge and I will sure participate. I am new but I believe own self. Just received my mug (4th one) with leather coaster (that makes 2 of those), mouse pad (love the #HAHD hash tag), my motivating clock and canvas bag. Thanks to Chris Knight and his great staff for their continued dedication to excellence in marketing. I am yet to receive mine, but I guess it is on the way…. Has it been sent already? I got mine today and posted pictures on my blog. 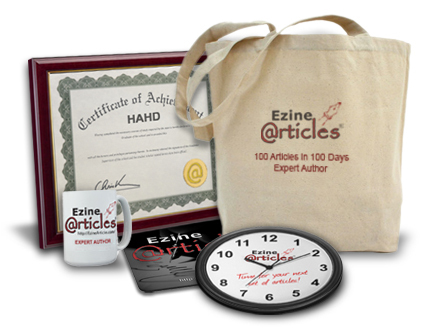 http://writingtipsblog.com/2010/08/26/hahd-4-goodies-are-here/ Thank you EzineArticles!